Just over a decade ago, Jonathan Stoughton ’18 took a hard look at his life and decided he needed a new path. At St. Edward’s, he’s grown from mediocre student to national scholar. Not everything was bad. He earned his GED. He managed to get work in coffee shops and food service. But turning 18 made him think about adulthood — and what he wanted from life. He longed to get out of Tucson. He wanted to shake free of substance abuse. After meeting with an Army recruiter, he joined the military, a path that promised discipline, escape and adventure. What Stoughton didn’t anticipate was that his life as an infantryman would reinvigorate his interest in education. His seven years of active duty included assignments in Georgia, Virginia and Hawaii, as well as missions in Kuwait, South Korea and Australia. The culture and people of each place fascinated him. While preparing for a deployment in Afghanistan (that was ultimately cancelled), Stoughton was asked to learn about the Kandahar region, including its history, politics and opium trade. “Opium production is an important part of the local economy, which presents the Army with challenges. On the one hand, you don’t want the production and export of heroin to be encouraged. On the other hand, you want people to have work that supports them so they don’t decide to join the Taliban,” he says. The Afghanistan assignment and resulting research made him want to learn more and more — and his commanding officers encouraged him to delve deeper. “Contrary to what many people think, the Army is a very socially progressive organization,” Stoughton says. “And one thing that they really emphasize is continuing education.” He enrolled in online classes, using his free time to take college-level courses in American history, literature, biology and other topics. 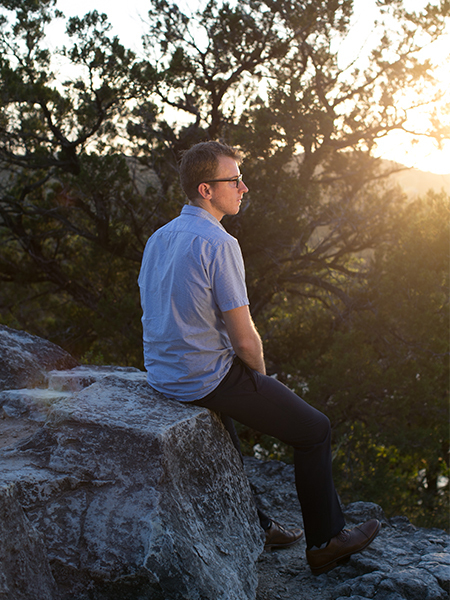 In 2014, after completing his Army service, Stoughton traveled for a few months and then settled in Austin, where he planned to establish state residency and attend the University of Texas at Austin. But his social circles brought him into contact with several St. Edward’s students, and Stoughton started to think that a small school with a liberal arts approach would be a better match for his interests: He wanted to study the languages, history, politics and cultures of the Middle East and was drawn to the Global Studies major. In particular, he leveraged those faculty connections when applying for scholarships to study overseas. Feedback from the Office of Fellowships, he says, helped him craft essays that won him a Boren Scholarship, offered by the National Security Education Program, and a Benjamin A. Gilman International Scholarship, from the U.S. Department of State, which allowed him to spend nine months studying Arabic at institutions in Jordan and Oman during his junior year. Stoughton also benefited from a faculty member’s nudge in a global public health course. A professor’s support and guidance led him to take a close look at the work of the Austin Harm Reduction Coalition, which aims to reduce the spread of HIV/AIDS and Hepatitis C by providing safe-injection education for active drug users. Ridealongs with staff members gave Stoughton a firsthand view of how policy and reality may not always align. In a paper he wrote for the class, Stoughton observed: “The stigmatization of drug addiction … has caused policies to be implemented that exacerbate some of the most dangerous issues related to drug use.” Those policies, he says, have in fact led to increased injury and death from diseases like HIV/AIDS and Hepatitis C and from overdose. This past summer he used a Summer Academic Excellence Award to fund work at RecoveryATX, a nonprofit organization that focuses on community education, outreach programs, community-building activities and addiction treatment services case management. His role involved developing new programs to create awareness for fundraising and drug addiction recovery. Learn more about the Global Studies major.